I like tiny, pocket-sized things. Especially writing utensils, like the Fisher Space Pen Stowaway, the cheap touch screen styluses, and now the subject of this review, the OHTO mini Sharp Pencil. All of these happen to be the same size. 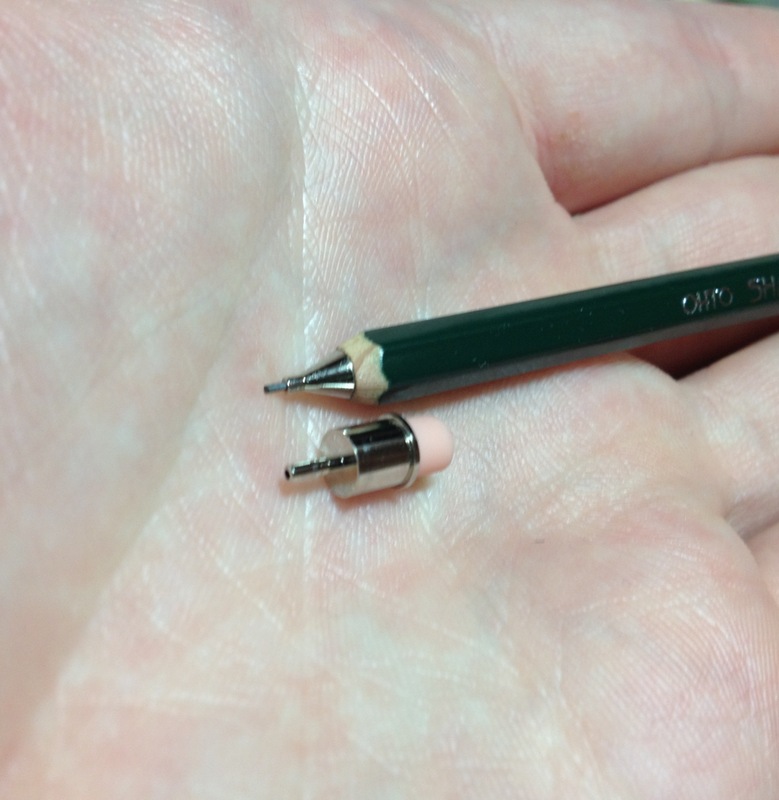 So the OHTO is cool both in that it matches many other small items you can buy, but it also might be the smallest mechanical pencil I have ever seen, being a little over 4 inches long and less than 3/16ths of an inch in diameter. But at that size will it still work well? Let’s take a look. The design is meant to mimic a wooden pencil. The outside of the pencil is actually made of wood and has a hexagonal design. Mine is in green, with silver printed information on one facet. The tip is sharpened like a wood pencil until about halfway when it is replaced by a metal cone that leads to a very short lead pipe. On the back there is a clip that is a separate piece of metal bent around and friction fit. Beyond that is the click mechanism that is really only usable when the eraser holder is installed. The eraser holder is quite a simple piece of metal that keeps the lead in the feeder, depresses the click mechanism, and holds a very small eraser. The wire-thin piece of metal attaching this piece to the body seems rather flimsy and easy to remove, but I have had no problems with it shaking loose: it simply doesn’t have enough mass. Likewise I have encountered no problems with the quality of any of the components. The lead seems to be HB. I don’t have the package (which is rather understated and nice by the way) with me so I don’t know what it is exactly, but I have no complaints. It writes well, and can be sufficiently dark. The eraser also works surprisingly well for its size, with very little being used to rub away quite a bit, but I wouldn’t say it’s a great eraser. 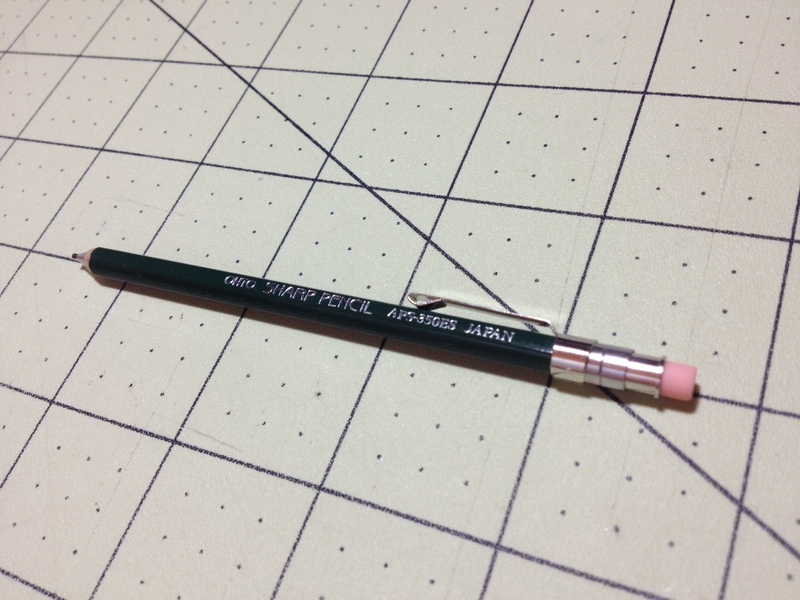 The click mechanism is satisfying and the lead is held very securely in place when one is using the pencil. The clip is also very good for the size, easily holding it in place while not damaging anything. In the end, for on-the-go sketching or writing I would certainly recommend this product. I also wouldn’t recommend it at all for stationary or desk-related activities. It is very small, and while that makes it portable, it isn’t the most comfortable of writing implements. It will hold up very well in a bag or a pocket, and it looks quite neat in my opinion. I’d just say be careful of the back end being knocked loose and stock up on some extra erasers and lead (it only comes with one of each) as one will likely run through them pretty quickly. This entry was posted in Intermediate Supplies, Utensils and tagged APS-350ES, art supplies, art supply critic, critic, import, inexpensive, japan, mechanical pencil, mini, OHOT, ohto sharp pencil, one the go, pencil, review, sharp pencil, small, tiny, travel, traveling, write, writing by Dragon Co (Austin Smith). Bookmark the permalink.